Petrobras announces that it has completed drilling two wells located in the Transfer of Rights area, in the Santos Basin. Results have confirmed the discovery of good quality oil in the pre-salt reservoirs referred to as Florim and Entorno de Iara. Well 3-BRSA-1215-RJS (3-RJS-725), informally referred to as Florim 2, is at a water depth of 1,972 meters, 7 km north of discovery well, Florim (1-BRSA-1116/1-RJS-704), and some 200 km off the coast of Rio de Janeiro state. Well Florim 2 has confirmed the discovery of good quality oil (29°API) in carbonate reservoirs of excellent quality below the salt layer at a depth of 5,412 meters, having reached the total depth of 5,679 meters. The second well 3-BRSA-1172-RJS (3-RJS-722), informally referred to as Entorno de Iara 2, is at a water depth of 2,249 meters, 7 km to the northwest of discovery well, Entorno de Iara (1-BRSA-1146 /1-RJS-711), and some 225 km off the coast of Rio de Janeiro state. Results from drilling well Entorno de Iara 2 have also confirmed the discovery of good quality oil (26ºAPI) in carbonate reservoirs of excellent quality below the salt layer at a depth of 5,116 meters. A significant 526-meter thick oil column was confirmed. 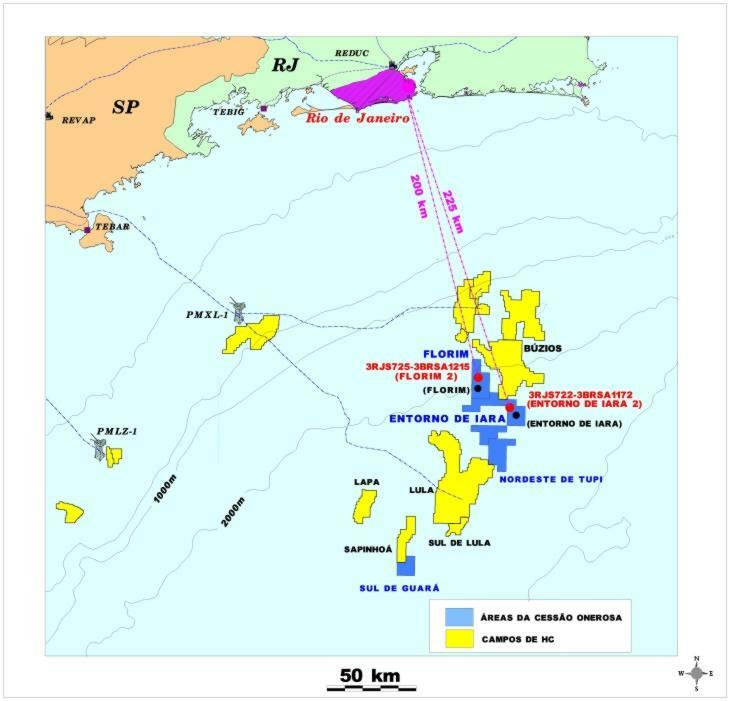 The drilling of well Entorno de Iara 2 was completed at a depth of 5,907 meters after fulfilling the objectives provided in the Transfer of Rights Agreement. The exploratory phase of these areas is expected to be complete by September 2014. According to the Transfer of Rights Agreement, Petrobras may declare commerciality of the area by this date.